In January 2009 - I wrote a post called "The Hearty Girls Go Biking and Cooking". I was on a recipe writing roll, high from a great winter's bike ride and enjoying the company of a good friend. Buried in the post were two recipes, one for Tuna Salad with Shredded Veggies and Hummus - an anti-mayonnaise tunafish spread. The other was a curried tofu salad, inspired by a salad I would often buy at the grocery store near my office. Great recipes that stand the test of time, but hardly anyone saw them. 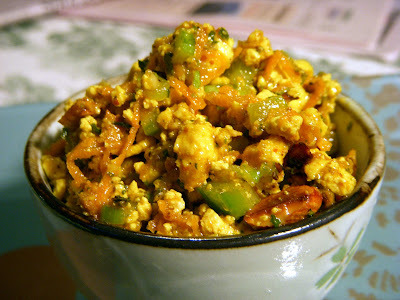 I even forgot about the curried tofu recipe, and it's a shame because it's a great salad and it deserves a stand alone post. So I cut it out and am "reposting" it here, two years and almost three months later. I'll be posting some other tofu recipes soon. I have a tofu parmigiana recipe on my draft board that I need to finish this week, as well as a tofu dessert. Call this The Bicycle Chef's National Tofu Week. Since I started Weight Watchers, I've completely given up eating mayonnaise. It's not hard to live without the Hellman's, but it is an ordeal to find ways to eat tuna salad on the WW plan that are quick, easy and tasty. I've had to say goodbye to quick trips to Wawa for a tuna shortie hoagie or making a daily run to the deli counter for a scoop of unctuous tuna salad oozing with mayonnaise. Luckily I remembered a tuna fish recipe from my Vorspeise days and have modified it for my core meals. As for the curried Tofu "Chicken" Salad, it's another variation of recipe ideas from Whole Foods and some careful reading of tofu salad containers. I hate spending close to $4 bucks for a 1 cup container of tofu and veggies when I know I can make it better, cheaper and healthier. The tuna with hummus is quick — and you can use any kind of hummus. I like Tribe brand, roasted red pepper. It's low fat and is not high in sodium. Sabra is another great brand, but definitely higher in fat. Yes, home-made hummus is easy to make, but honestly, there are some great brands out there and it's my compromise on finding a mayonnaise alternative. The tofu salad recipe has more steps and prep work, but if you are looking for ways to incorporate tofu into your mostly vegetarian/vegan diet, then this recipe is worth trying. Drain the tofu and pat dry. Shred it or finely grate it. Alternatively, you can finely dice the tofu. Add it to mixing bowl and set aside. Toast the curry powder in a dry skillet for 3 minutes until the curry powder becomes fragrant. This will enliven the curry and bloom its flavor. Add 2 tablespoons of the toasted curry powder (reserve the other tablespoon of curry) to the shredded tofu and stir in the tablespoon of olive oil. Mix in a 1/4 teaspoon of salt and a few grinds of black pepper. Spread the curried tofu onto a sheet tray or oven safe baking dish and bake the tofu stirring every 10 minutes, or until the tofu becomes crisp around the edges, appears firm and any moisture has evaporated; bake for 30-35 minutes total. While the tofu is baking, shred the carrots, mince the celery and onions and chop the parsley. Add to a mixing bowl and set aside. Chop (and toast if needed) the almonds and add to the vegetable mixture. Whisk together the salad dressing, Dijon or honey mustard and the remaining tablespoon of curry powder; set dressing aside. Remove the tofu from the oven and cool. When the tofu is completely cooled, add it to the prepared veggies and almonds. Pour the curried vinaigrette over the tofu and stir to combine. Tasted and adjust seasonings, adding more salt or pepper to taste. Makes 3 cups of tofu chicken salad. Serve at room temperature or cold and garnish with freshly chopped parsley. It sounds pretty good, but I'm kind of anti-tofu. I will probably make this with actual chicken, but that's ok. I welcome new ideas.